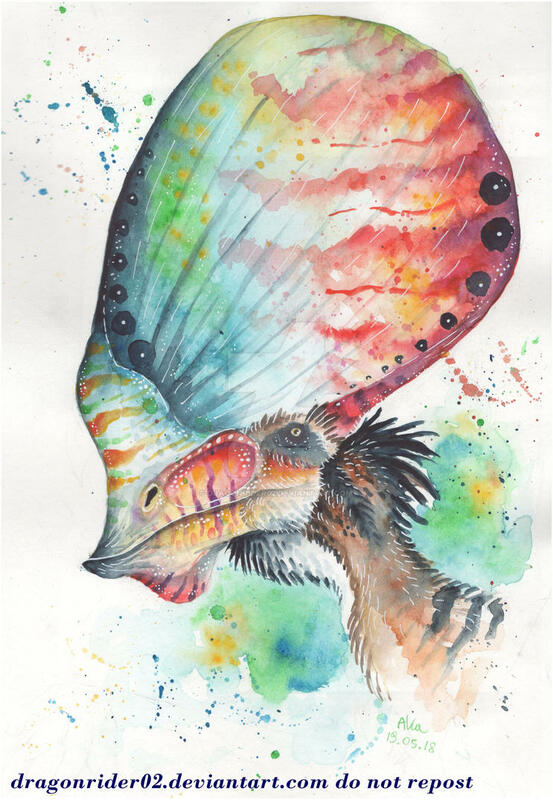 I loved drawing dinos since I was 4 years old So I though I may share some of my dinosaur drawings/paintings with you! I often sacrifice accuracy for overall artistic apperence. I love the colors on the Hatzegopterix! 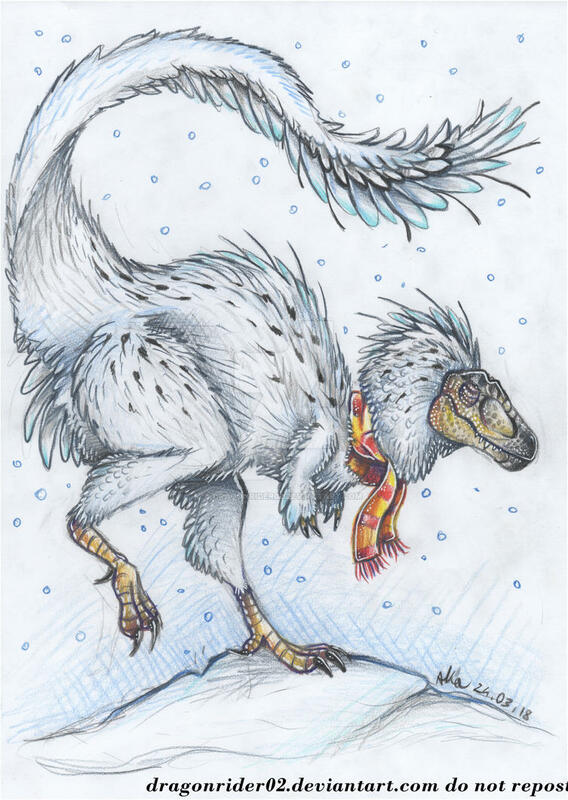 That nanuqsaurus is so adorable all happy in the snow. I like your choice of colors. 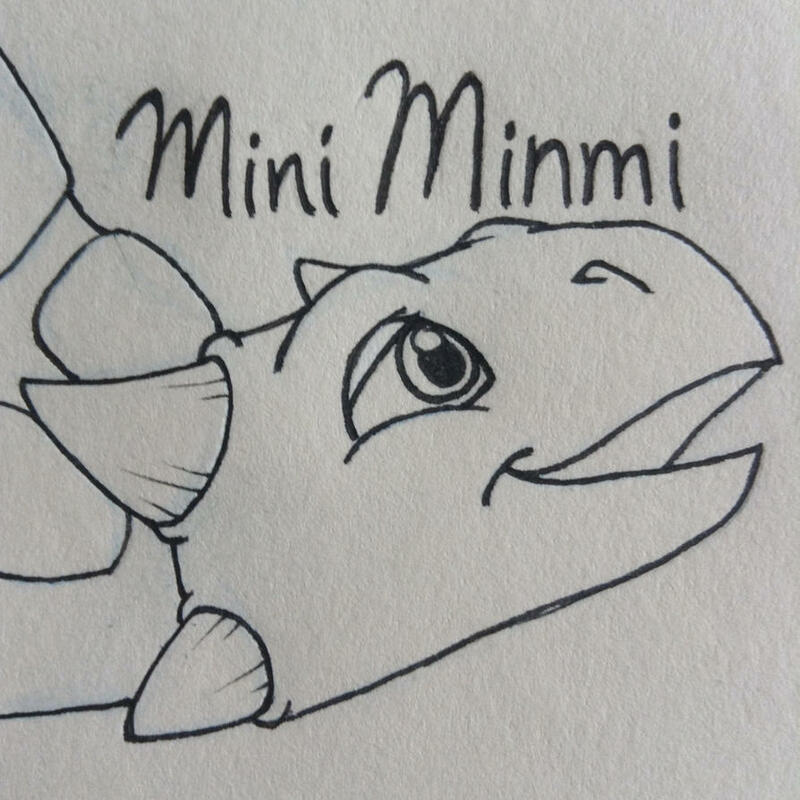 It makes your style unique and blends well with your medium (aquarelle? Or maybe inks?). Thanks! I mostly use watercolors or color pencils or Promarkers. I can't see any of the pictures in your gallery. They look like they've all been archived. Anyway, these are gorgeous. Your use of color is impressive. 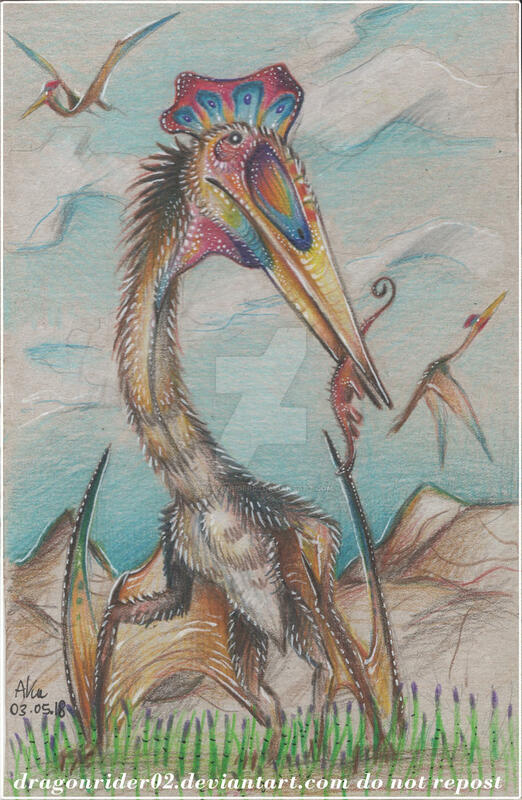 It's really nice to see stylized, but not straight up goofy dinosaur art. 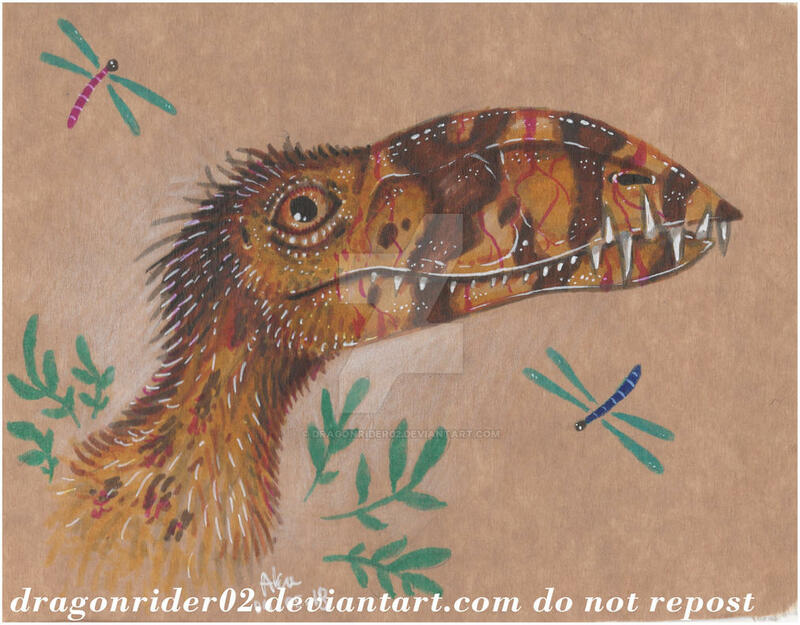 Very often either you see meticulously measured paleoart, or you see cutesy or outdated reconstructions in the more stylized work. This is the type of work I like to see more of. You must have DA account to see my things. And thanks! 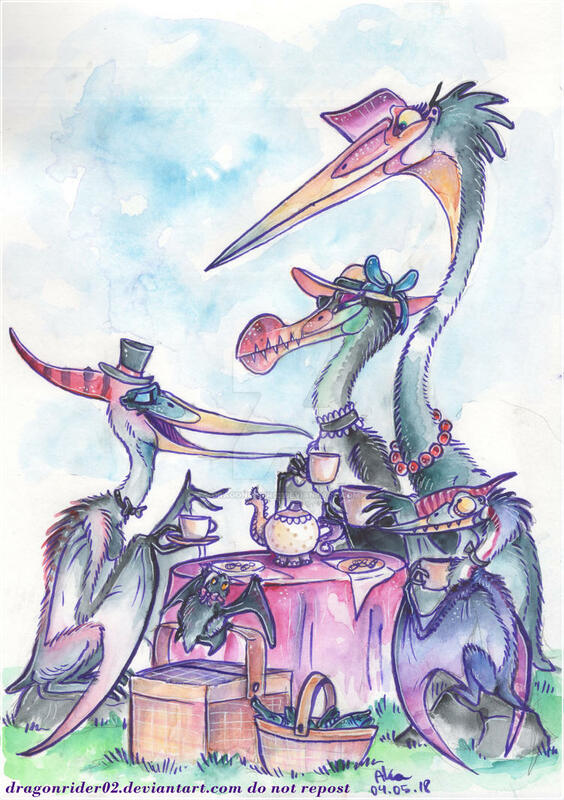 LOVE that Pterosaurs tea party. It seems that miss ammoni, miss mesembrinus and miss northropi enjoy mr longiceps tales. But mr weii seems to be more interested in one of the taller misses. 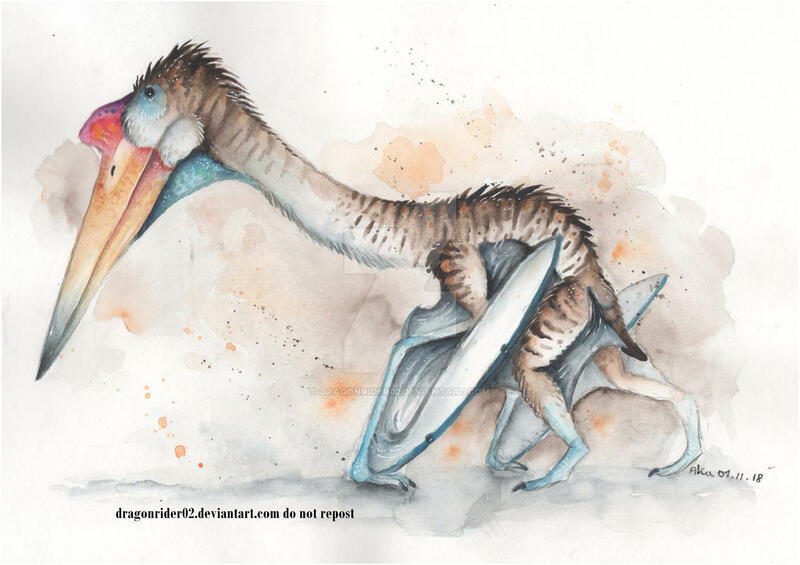 Great work - prehistoric animals inspire in so many ways! And, yes that teapot is a missed opportunity for makers of such utensils! - I would buy one in a flash, and probably actually use it, being a tea drinker and not a coffee consumer. 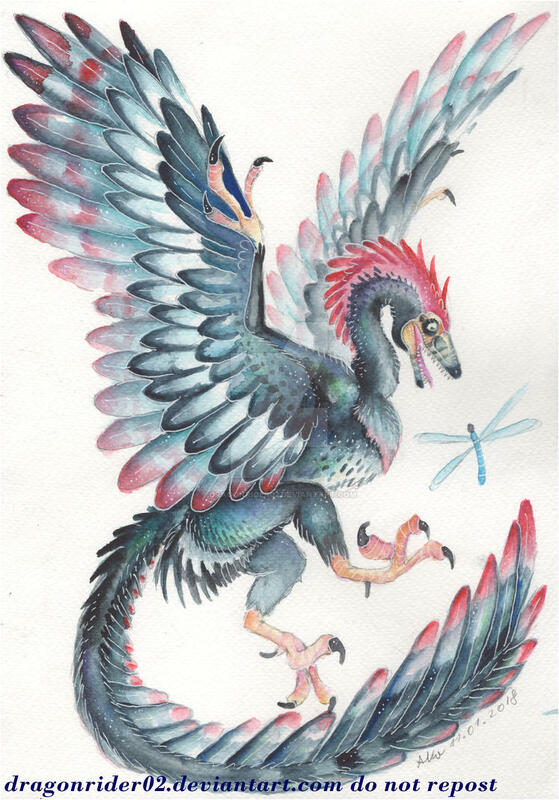 Feathered Dinosaurs certainly provide the opportunity for these animals to be depicted as much more colourful than they ever were in the old-school books, and you have really run with that. 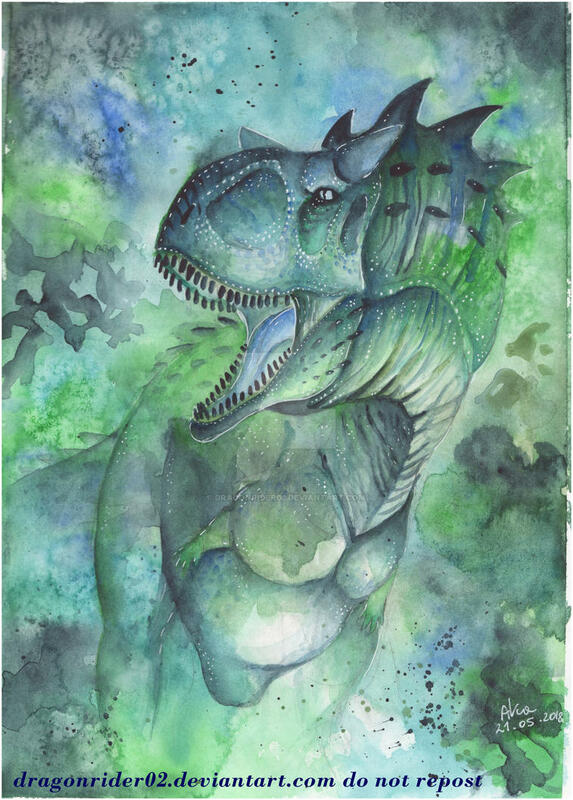 Jungle Carnotaurus. It was real pain to get shape of his skull more-or-less right! 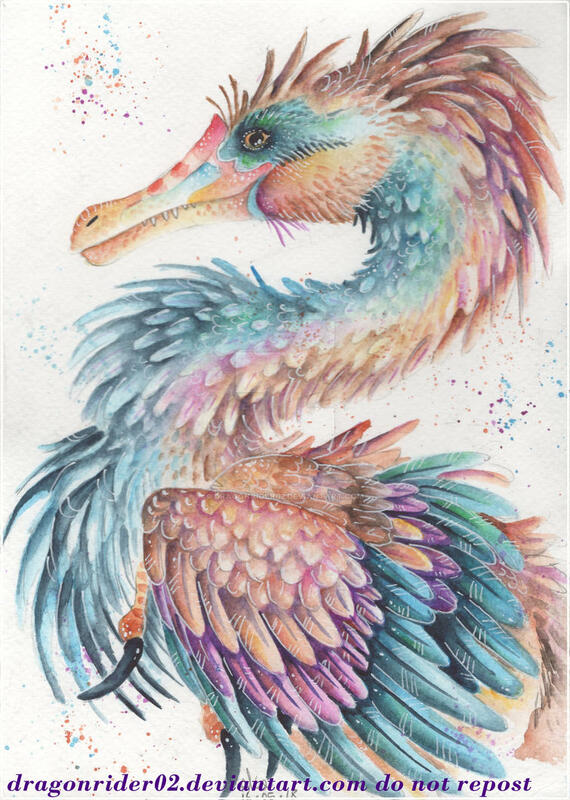 Beautiful job, I think you are very skilled in the use of color, there are not very often used colors in your art but they look so pleasing. 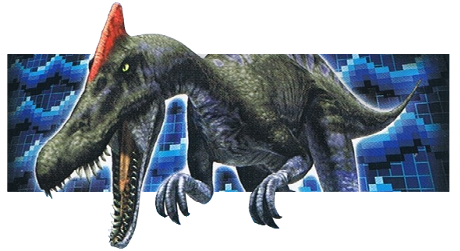 Okaaaaayyyy... Spinosaurus, what's with that look? Also, where can I buy a rubber pteri? 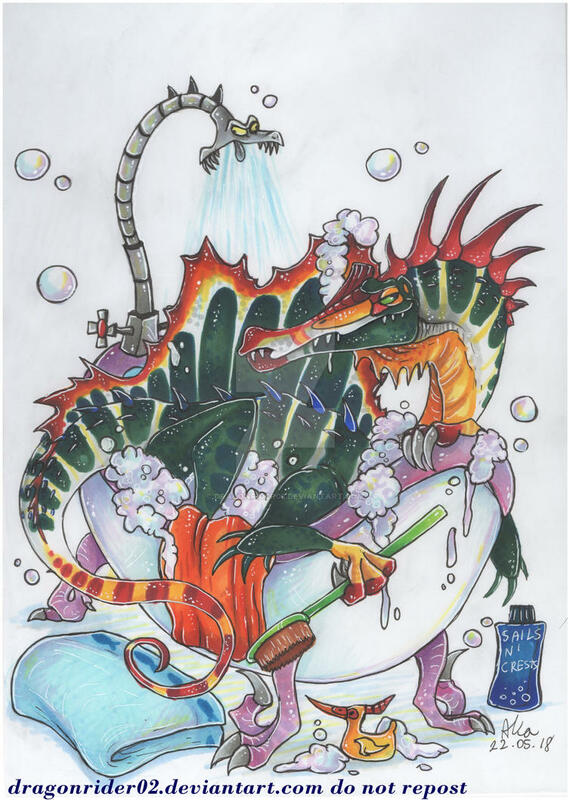 I love the little details like the raptor claw-foot tub and the aforementioned rubber pterosaur. 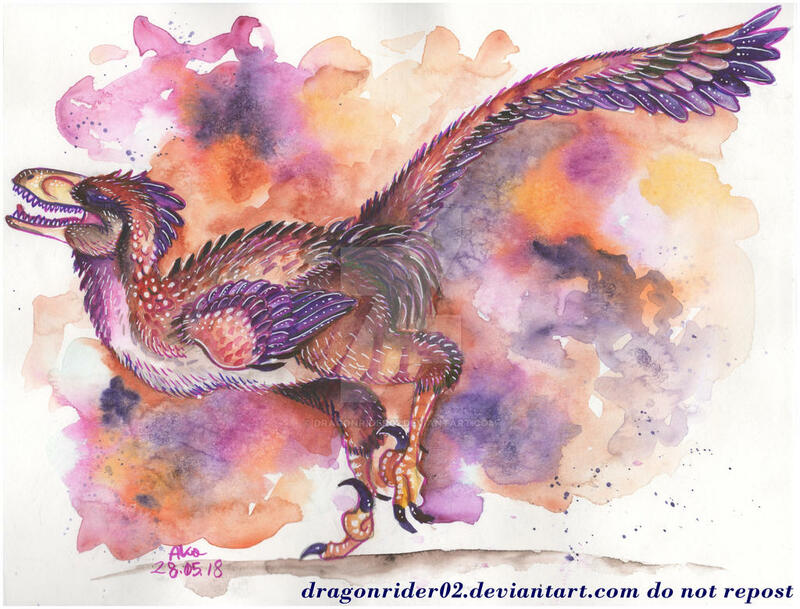 Watercolor Deinonychus. 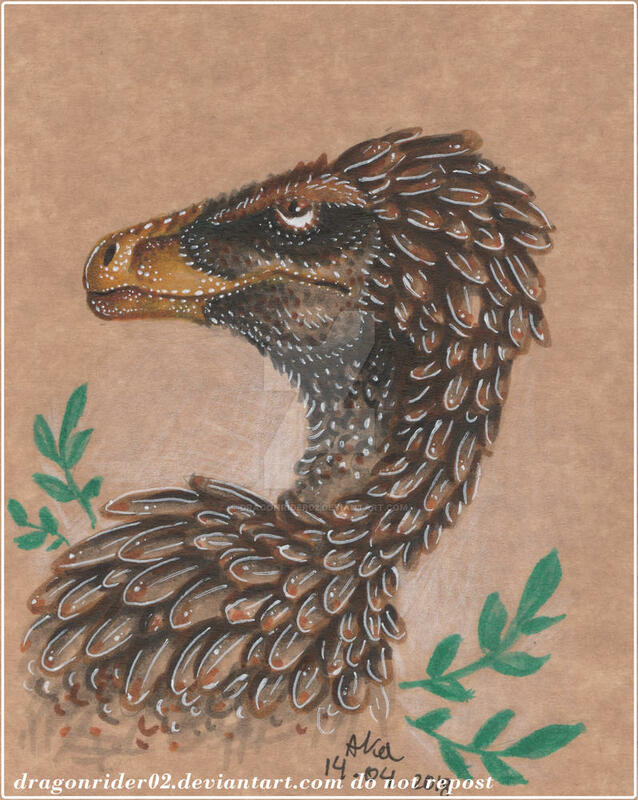 Or some other fluffy raptor. His name is Potato. That is one dazzling potato!